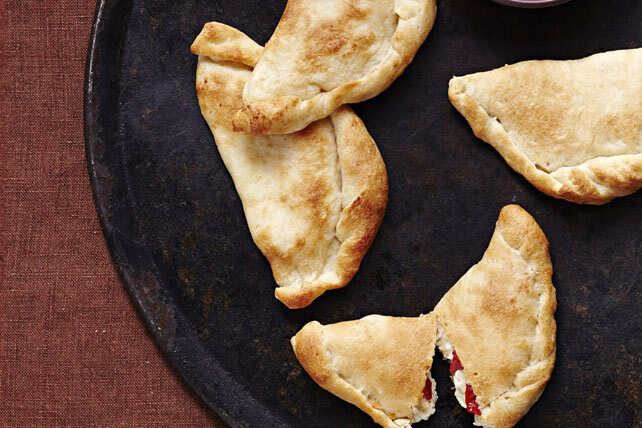 Friends and family are sure to love these super-easy cheesy calzones. Unroll pizza dough on lightly floured surface; cut lengthwise in half, then crosswise into thirds. Roll or stretch each piece into 6-inch round. Spread dough with cheese mixture to within 1/2 inch of edges; top with peppers. Fold each dough round in half; pinch edges together to seal. Place on parchment-covered baking sheet. Bake 15 to 20 min. or until golden brown. A few minutes before ready to serve, warm the pizza sauce. Serve calzones with sauce. Serve with a mixed green salad and cold glass of milk to round out the meal. Calzones can be baked ahead of time. Cool completely, then wrap individually in plastic wrap. Place in freezer-weight resealable plastic bag. Freeze up to 3 months. When ready to serve, place desired number of frozen calzones on baking sheet and bake in 350ºF oven 20 min. or until heated through. Or, place a frozen calzone in your insulated lunch bag in the morning - it should be thawed by lunchtime. When ready to serve, unwrap calzone and microwave on HIGH 1-1/2 min. or 2 min. or until heated through, turning after 1 min.